What is the legal status of Bitcoin and other cryptocurrencies around the globe? Check our review of crypto legalisation in Russia, China, South Korea and etc. April became a good month for BTC when the price jumped by $1000 just within a few hours. We gathered the main reasons for​ the BTC bullrun. Freewallet reviews the main price cycles of BTC during its 10 years history. Freewallet will abandon support for Fantomcoin on Freewallet: Crypto Wallet and Fantomcoin wallet. March crypto digest of the most important events in the industry. Freewallet has added BitTorrent token on Freewallet: Crypto Wallet for iOS, Android and the web. We continue our series of posts regarding cryptocurrency mining. Recently, Freewallet has been featured on the Netflix show called the OA. Have you ever heard about the blockchain smartphones? If not, dive into the blog post. Recently, Enjin coin significantly gained at price after the news regarding the partnership with Samsung. Freewallet has decided to take a look at the coin and the partnership​. Freewallet is glad to welcome KIN coin after the token swap and migration to their own blockchain. Enjoy KIN coin on Freewallet: Crypto Wallet – an official wallet for KIN coin. All February cryptocurrency news, which you should know. Today, freelancing has become a staple of modern life. Being your own boss is a lot easier when you’re using crypto. Read about the best freelance platforms where you can earn cryptocurrencies. Freewallet continues its series of guides for crypto beginners. In this article we will talk about EOS coin and why it is called the Ethereum killer. Cryptocurrency mass adoption is a dream of crypto-community. It's the second article in our research regarding the ​current state of crypto adoption. Have you heard about a Bitcoin ETF? If your answer is no, then this article is for you. Freewallet is going to switch from using Google+ to Google account as a login option. Everything you need to know what happened in crypto industry in January. What is destination tag and memo and how does it work? What is a destination tag and memo and how to use them?​ Read the article to know more. Freewallet is excited to welcome the Lumen coin to our list of supported currencies. Determined to decentralize and democratize participation in financial transactions, Stellar has advanced a vision and goals that align with our own. Freewallet team is glad to announce a swap of Monero Original to Monero Classic. Store, exchange and make secure transactions on web, iOS and Android. Let’s take a look at some of the projects that stand to influence the crypto market the most in 2019. Do you want to start using crypto but don’t know how? Check out our list of ideas on how to get crypto for free. Come holiday season the Freewallet team does two things: we eat as much holiday candy as we can get our hands on and we churn out analytics. Previous year our customer support department gathered the most common questions they got asked by the users of Freewallet in 2018, and in this (and the following) article we’ll answer all of them. Freewallet adds Bitcoin Cash SV following the Bitcoin Cash harfork. Freewallet, a digital multicurrency wallet with over 3M users, is proud to announce the long-awaited listing of XRP on the Freewallet Multi-currency wallet, and a subsequent stand-alone XRP Wallet app for Android. Freewallet has added XRP to its list of supported coins. We’ve prepared a Ripple Guide for you. Cryptocurrency is a bubble and there’s no practical use for it? Check out the article, we will prove that you are wrong. What kind of crypto user are you? Let’s find out. If you’ve been keeping up to date with the latest news in the cryptoverse, you’ve undoubtedly heard about the Constantinople hard fork. Everyone’s buzzing right now about Ethereum’s upcoming hardfork, and, like always, not all the information out there is accurate. There was a hard fork of the Ardor platform on January 9. Freewallet updated it’s software and supports the hard fork. What’s coming in 2019 for the cryptocurrency sector after the massive crush. Take a look at some expert insights and ideas about the future of the crypto industry. The Freewallet team had a fruitful year. Let’s trace all our achievements for 2018. Freewallet has added VeChain coin (VET) to list of supported currencies. Now, Freewallet users can store, transfer and exchange VET in their wallets. The DigiByte (DGB) currency, which is focused on top security and high transaction speed has joined Freewallet’s list of supported coins. Looking for some gifts? We have prepared a guide for crypto shopping and found stores which accept cryptocurrencies as payment. How many people on Freewallet's Crypto Watchlist do you already know about? Read on to find out whom we look to for inspiration and insight. Our look at mining continues with a primer on what's coming in 2019. Claude Lecomte, CEO of MinerGate joins the blog to take us through some of the basics of crypto mining. Take a look at what's been happening recently at Freewallet. We've got a lot of new developments to share. The Freewallet team was one of the first to support EOS, adding it to our Multi-currency wallet right away. We have also subsequently released an EOS wallet for Android especially for EOS enthusiasts. Our customers have enjoyed fee-free and secure transactions within the Freewallet ecosystem and now they can send EOS to other wallets absolutely free of charge. PumaPay (PMA), a token that brings blockchain and crypto solutions to e-commerce, has joined Freewallet’s stable of supported cryptocurrencies. The first chatbot technically appeared in the 1960s. But they have only become widespread in recent years, as a result of text messaging becoming a pervasive part of life and progress in machine learning. Major technological giants such as Microsoft, Facebook, Google, etc. have chatbots to make life for their users much easier. Customers can find answers to their questions within a few seconds just by texting on their phones. The Freewallet team wants our community to feel as comfortable as possible when communicating with us, so we have created a chatbot to improve our service and solve your problems as soon as they appear. Freewallet welcomes TrueUSD, Digix, Paxos, and USDC to its Multiwallet Platform. This new additions join Tether and DAI on Freewallet’s burgeoning list of stablecoins. The crypto industry is becoming more and more user-friendly each day, but still, one of the most common questions among crypto beginners is how to buy Bitcoin or other cryptocurrencies. The Freewallet team has released an outstanding feature, which allows you to purchase crypto as fast and easy as ABC. 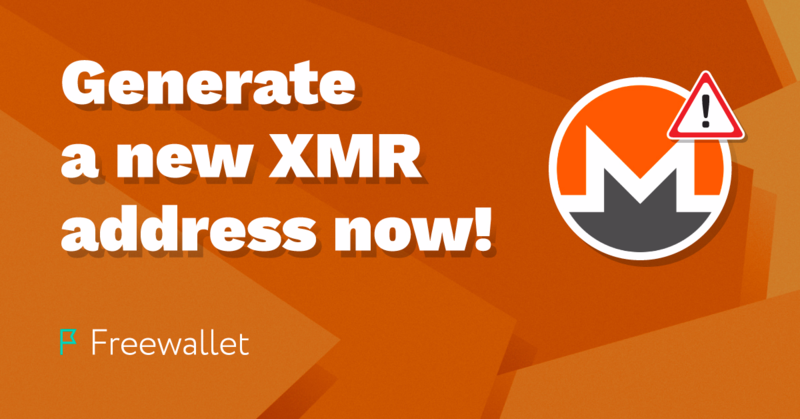 Now our customers can buy coins seamlessly in their wallet, without having to visit other services or exchanges. Freewallet has added the DAI ERC20 stablecoin to its list of available cryptocurrencies. Starting today, Multiwallet on iOS, Android, and the web supports all operations with DAI coin. Freewallet users will be able to make regular Bitcoin Cash transactions up to 11 am GMT today, Thursday November 15th, about six hours before the BCH hardfork is scheduled to occur. With the Bitcoin Cash hard fork fast approaching, at Freewallet we would like to reassure our users that we will support the BCH hardfork and the two subsequent tokens that stem from it. Are you getting ready to celebrate All Hallow’s Eve? 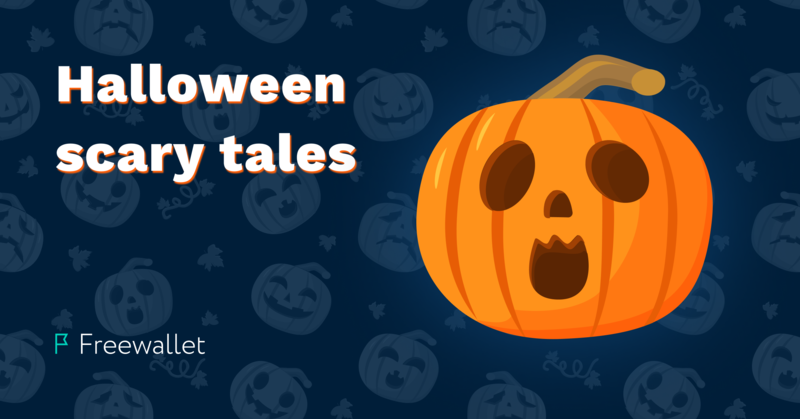 Our fantastic team wanted to tell you a couple of harrowing tales based on real events. Let’s have some skele-fun! Ethereum Wallet by Freewallet on Android, one of the first Ethereum wallets with the largest current user database is finally back and available for download on Google Market. It has been missing from the Play Market for almost a week and the Freewallet team would like to explain the situation and elucidate to its users why it happened. At Freewallet we receive numerous refund requests every month. Whatever the reasons are for the request, we always try to comply with our clients’ wishes to the best of our abilities. However, providing a customer with a refund is never a simple process. What can you do with cryptocurrency? There are massive online market places where you can buy and sell coins, there are online and offline places where you can store what you have, and there are methods of acquiring currency through time and effort, namely mining and using faucets. Have you heard of the new LTC SegWit address format? We have. We have updated our software to support the new format. For most of you, this won’t change anything, just improve transaction times. In this blog we’ll explain everything you need to know about the update. Yes, it’s that urgent and important. We have updated our software to increase security for our users. Our new software requires new wallet addresses. The past couple of weeks we’ve been posting about our special security features — cold storage, transaction limits, multisig. The next in the pipeline is PIN code, which we’ve recently made mandatory for all our accounts. BANKEX is now live in Freewallet! Starting today, BKX, an Ethereum-based ERC-20 utility token, is available in Freewallet. All Freewallet users can exchange their cryptocurrencies to/from Bankex in Multiwallet on iOS, Android, and web. They can use the ERC-20 token to pay fees in the BANKEX Trust Service, BKX Scan and other BANKEX products and services. The buzz of Bitcoin mining has gone, but there are still millions of people interested in making money out of thin air. Technically, this is exactly what mining is, but as you know, the devil is in the detail. Here’s what you should know before you overpay for your first mining rig on craigslist. In the crypto world, security is everything. We take the security of our users’ accounts more than seriously, so our wallets are equipped with a cohort of top-notch security features. One of them is multisig. Read on to find out what it is, how it’s implemented in our wallets, how to enable it and how it can be used in real life situations. 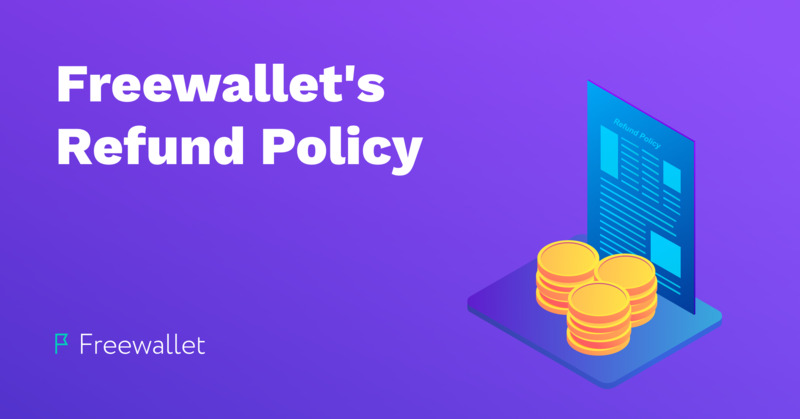 As a hosted (or custodial) wallet, Freewallet is able to provide free and instant transactions between Freewallet users. Those transactions are not registered in the blockchain, which saves users from paying a network fee. Freewallet is famous for its disruptive security features. Being one of the rare hosted wallets, it secures user funds with 2FA, multisig and a cohort of optional security settings. Today’s post is about transaction limits, a feature that allows you to limit the amount of coins that can be withdrawn daily or weekly. There are times to brag, and times to keep a low profile. But when it comes to talking about our Customer Support team, we can’t mention enough how proud we are of the job these guys are doing. Not only do they constantly monitor social media, forums and app store reviews, they always provide high quality assistance and resolve the most technologically complicated cases. In custodial wallets, payin and payout addresses may be different. That's because of the cold storage, an offline vault used for additional security of your funds. Dive in to know more. So, you might have seen the phrase — “Freewallet is 100% a SCAM!!! !” possibly several times and in several places. It’s like a big fat elephant in the room: most of our users have seen at least one of those threads on reddit or BitcoinTalk, but we haven’t yet posted any official denial of the rumours. Well, here it is. We are not a scam. Today, Freewallet is releasing TRON Wallet, a wallet dedicated to TRX on Android. We are also adding TRX to our flagship wallet, Multiwallet, available on iOS, Android, and web. In April 2018, we implemented Top Up Phone, a feature that allows our users to refill their prepaid mobile phones with Bitcoin. Today we’ve added this feature to our mobile apps — Multiwallet and Bitcoin Wallet for iOS and Android — and want to tell you about another way to use it: exchanging bitcoin to fiat currency. During the World Cup, even the biggest sceptics get caught up in the football frenzy and consider making a bet! With bitcoin and other crypto, it has never been easier. If you too want to test the odds before the next game, here’s a list of the online gambling sites that accept bets on the FIFA World Cup in bitcoin and other cryptocurrencies. Imagine Harry. Harry loves Bitcoin. Recently, Harry sent Bitcoin to his friend’s Bitcoin Cash wallet. The money left Harry’s wallet but never got to his friend’s account. Turns out, sending BTC to BCH was not the best idea. Our support team helped Harry to get his coins back, but they had to jump through some hoops. Meanwhile, Harry was very upset. Bottom line: don’t be like Harry. Always check if you’re sending your coins to the right address. Additional security measures are annoying, so we’ve heard, but disregarding them is a very big mistake. We take security very seriously and constantly implement new features to protect our user’s funds. One such feature is the active sessions control. As the TRX holders around the world are getting ready for the mainnet launch, we’ve prepared something special for our users! With the amount of personal data that we store online, additional security measures such as 2 factor authentication are, in fact, not longer optional, but mandatory. However, additional security requires additional precautions in case something goes wrong, and it fully applies to 2FA. What if you lose your phone? What if you lose access to your email account? Whenever your transactions fall through, there could be several reasons for it. One of them is the blockchain or app downtime. From July 2018, Freewallet is going to launch paid refunds. 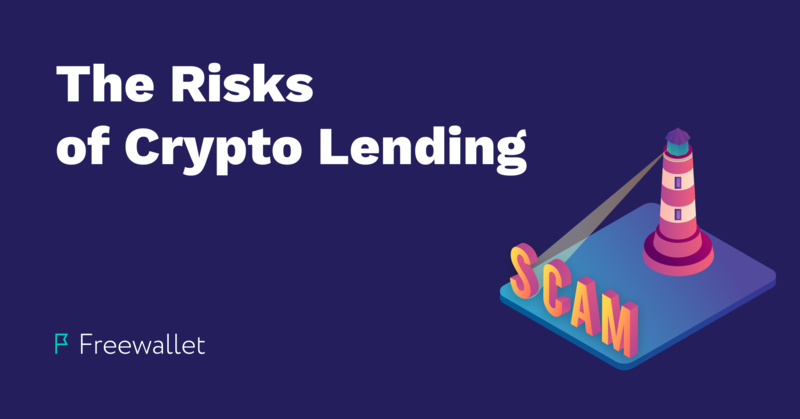 It means that if your funds get stuck on the blockchain and if it is technically possible, we can provide a refund. This May, we’ve implemented a bunch of cool new features to enhance the security and usability of our wallets. Check out the most prominent ones. Acquiring cryptocurrency prompts the question of how you will handle your coins. There are several types of wallets, and each one has its pros and cons. In this overview, we’re covering the features of a hosted wallet as one of the ways to store your coins. When it comes to online security, people often get careless as they don’t realize the direct consequences. To help you stay safe while working with your crypto coins, we made a list of basic security rules, based on the most common support request cases. They are not ground-breaking, but will help you refresh your memory of what is and isn't safe to do online. On June 1st, 2018 Block.one, the company behind EOS, will distribute the last block of EOS tokens. On that day at 22:59:59 UTC, all EOS Tokens will become fixed (ie. frozen) and will be non-transferrable on the Ethereum blockchain. Before that happens, you can either exchange your EOS Tokens for another cryptocurrency or wait until a new blockchain is created. We are constantly working on making Freewallet more friendly and secure. Meet our cool new features below. Refill your prepaid mobile phone with Bitcoin. Right from your wallet. Now Freewallet supports money transfers to SIM cards with over 400 operators in 100 countries. The feature is currently only available in the web version, but will soon be added to all Freewallet platforms. In October 2016, Freewallet team released a dedicated wallet for Ardor, a digital asset which was later included in our Multi Wallet app. Initially a part of the NXT blockchain, ARDR switched to a standalone network on January 1st, 2018. Here’s a short story of how Freewallet helped Ardor holders get their assets home safely. On Christmas 2017, Bitcoin announced six new hard forks, with Lightning, Platinum, GOD, B2X, Uranium, and Cash Plus now joining Cash, Gold, Diamond, United, HOT, and Super. These forks show that Bitcoin never ceases to evolve and multiply, in turn generating both excitement and chaos among the crypto community. Don’t waste your time searching for a present. Impress your friends with digital cash that will definitely have an impact on them (and grow in value). Bitcoin has shown a tremendous growth in 2017, with its price touching $20,000 and its introduction on to the futures exchanges. As a result, the BTC network is overloaded at the end of the year. Massive transaction delays are reported by all wallet operators, and network fees reach up to hundreds of dollars in equivalent. Freewallet, a mobile-first cryptowallet developer, has presented a full-scale Multi Wallet version for desktop. This significant release tops off 2017 run by the company that has accomplished 8 new currencies this year including such ambitious projects as the world-first Bitcoin Cash and Bitcoin Gold wallets.